Is it difficult for anyone out there to pray for five minutes, let alone on all occasions or always? * You are not alone. But friends, just because it is difficult doesn't mean we should give up. Commands and reminders to pray permeate Scripture and Jesus prayed regularly. We need to consider prayer and be pray-ers if we confess Christ as our Lord. We need to take up our armor AND PRAY. You'll notice that prayer is not listed as one of the pieces of armor, but certainly it is a weapon that goes hand in hand with our sword of the Spirit, God's Word. And given that it is mentioned in this section, Paul is saying, Hey, if you want to stand firm in the face of devil's evil schemes, you gotta pray: all the time on all occasions with all kids of prayers and requests! The servant of God is covered in armor and equipped for the offensive with the Word and Prayer. If we are not praying, we are not doing battle as God intends for us and we will not be standing in the end. Our struggle, our real issues, are spiritual. The goal is to stand and stay standing when the day of evil comes. The standing Christian will be the praying Christian! If you want to stand firm, get on your knees. At this point, guilt might be creeping in about what a "bad pray-er" you are. You may be feeling the temptation to give up or to pull yourself up by your boot straps and do better this week. Let's toss aside both of those options for now and simply consider how prayer assists us in battle and helps us to stand firm. Prayer is a life-line to our Commander. Talking with Him reminds us who He is, who we are, what He has done for us, and that our enemy is weaker than he appears. We are humbled and strengthened by these communications. Prayer reminds us that we are dependent on God, but also defended by Him, the blood of Christ, and the indwelling of the Holy Spirit. Prayer is often a place we receive our marching orders! In prayer our hearts are often pricked to God-honoring action. Prayer keeps us alert. The more we pray, the more we remember how awake we need to be and aware of the spiritual war waging around us. With our eyes stayed on the Lord, we are aware, but not overcome. I think we fall into the satan-trap of thinking that we need to achieve some level of eloquence or meet some time goal to be a "good" pray-er. But Paul simply says here, and pray. Pray! Whatever you're up to, whomever comes to mind, whatever situation presents itself, whenever the time, PRAY! We can communicate with our Commander at any point in our day. His omnipresence permits and His Spirit assists! Trouble remembering to pray or getting in the habit of prayer is not new. Paul was always reminding His readers to pray! He often included prayer in his final instructions in His letters. Jesus pleaded with His disciples to stay awake and pray! We're in good company in our human nature. But because the Spirit lives in us, we can grow in this area and see God work in new and exciting ways in our hearts and our lives and the world around us. 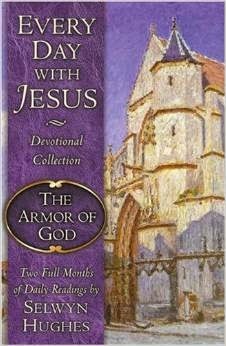 I have a couple of Armor of God devotional guides to give away! I went through it years ago and loved the daily readings. My mom gave me a new copy last week and I was going to give it away. Then I discovered that I, too, had a extra copy. So I have two to give away to two lucky winners! Woo-hoo!! These are small books with two months worth of daily readings with associated Bible passages all related to the Armor of God. I have worked my way through three of Selwyn Hughes' books and benefited from and enjoyed each of them. I hope you will experience the same if you're one of the winners! This would be a great way to continue thinking about things discussed throughout this series. How can I enter? you ask. Here's the scoop; you will receive one entry for each thing you do below. I think that gives you plenty of opportunities to get your name in. One advantage of the small-time blog is that you have a much higher percentage chance of winning in a giveaway. :) Just get your name in before next Sunday night (Sept. 28) at midnight. We'll choose the winners on Monday morning; my kids love getting to pull names from the bowl! * If you want a book to jump-start your prayer life, please get your hands and eyes on a copy of The Praying Life: Connecting with God in a Distracting World, by Paul E. Miller. Love you and your encouragement, friend! Your faithfulness is a blessing to me! Thank, Jenny! Boy, I wish we lived closer to one another. Thanks for doing this series. It has been a great encouragement to stand strong in our faith. This is great and timely encouragement for me today! Thank you Heather!